The Kane Creek trail begins at the top of Kane Creek Canyon, on Highway 191, across from the strange attraction (can't remember what it's called) where somebody built a several-thousand square foot home in a hole blasted and carved out of the red rock. 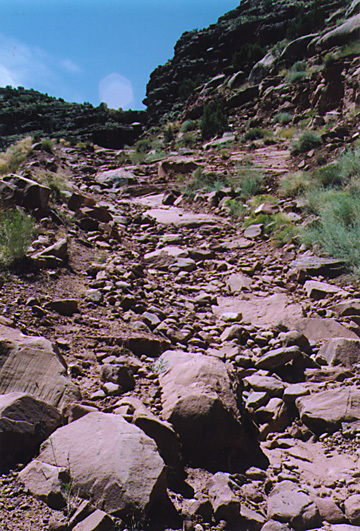 The trailhead is somewhat hard to find, as the trail itself follows a gravelly stream bed for a ways before dropping into the canyon itself. The trail crosses the stream numerous times. 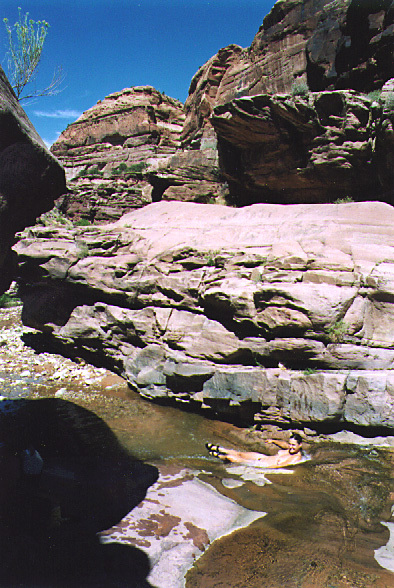 Near the top of the canyon, this involves climbing and descending some steep, loose ledges (with wet tires) that makes things interesting. The upper middle section of trail gets quite narrow, with 500+ foot drops into the slot canyon below. Good clearance here is helpful, as there is no way to bypass the large rocks scattered on the edge of the route. The scariest section for me was a long hill coming down into the bottom of the canyon. The hill was strewn with big rocks that liked to roll as soon as I got on top of them, making the descent a real lesson in disaster control. I wished the whole way down I had taller tires and lower gears, but I at least had some decent skid plates if all else failed. My wife and I did this trail solo (not reccomended) so I was concerned about getting high-centered on something I couldn't get off of without a strap or winch. 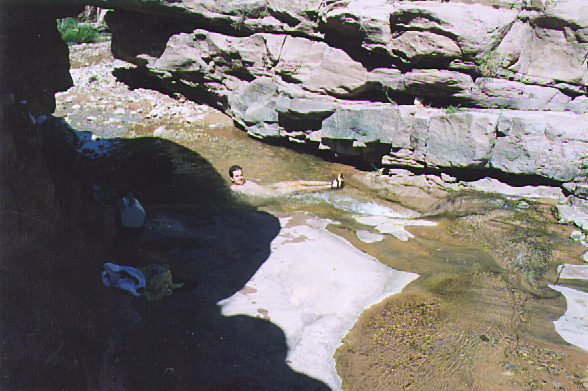 There was also the thought all along that I might run into an obstacle I couldn't get past (like a deep hole in the creek, or a washout) which would force a return trip back up the canyon. 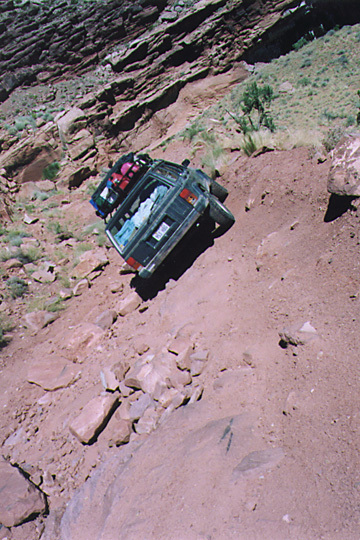 With a little banging, scraping, and slipping, we made it down into the bottom, which criss-crosses the creek about 50 times before you finally end up on Kane Creek Road on the East side of the Colorado. I did my first-ever involuntary sheet metal modification in the lower part of the canyon as I dropped down off the bank into the creek. It looked like no prob from inside the Jeep, so I didn't get out to look. As soon as the front tires went over the whole Jeep dropped about four feet onto the nose, leaning up against the driver's side quarter panel. There was nothing I could do with two tires in the air but give it some gas and hope for the best. I ended up with a busted taillight and a creased quarter panel, which wasn't too bad all things considered! A good learning experience on many levels. Great trail, but go in a group (DUH!) and watch for flash floods, as the level of the creek can change radically in a short period of time if it's raining at all!